As FairPoint Communications struggles to stay afloat, its Vermont competitors are beginning to circle. Burlington Telecom, one of the smaller sharks in Vermont’s sea of telecom operations, announced it is ready to fill any void left by a flailing FairPoint. With only 4600 subscribers and a data hub capable of serving at least 100,000 households, BT has room to grow. “The governor wants to expand broadband services in Vermont, and we have the ability to do it — right now,” said Jonathan Leopold, Burlington’s chief administrative officer. News of BT’s expansion comes on the heels of a failed 7-7 city council vote that would have given BT more public oversight, perhaps even making it a city department. Mayor Bob Kiss claimed any such scenario, with the inevitable proprietary business information, would have jeopardized BT’s competitiveness. Most of BT’s “oversight” occurs in closed-door sessions, either before the finance board or the city council. But Kiss did not seek approval from either body about bringing BT to Vermont’s hinterlands. Although most councilors appear to support the expansion, it was news to them. Leopold said councilors will ultimately vote on a specific plan in the coming weeks, but BT was pressed for time: It wanted to raise the issue of expansion at a prior scheduled hearing before the Vermont Public Service Board. Why is BT going before the PSB? Because the city is in violation of two key covenants in its license to do business, known as a certificate of public good: It hasn’t laid cable past every Burlington home, and it hasn’t repaid taxpayers millions of dollars it borrowed this year to stay in the game. To survive, BT needs to expand. When BT launched in 2007, officials said it would take $33 million to fund its startup, rope in 5000 customers, run fiber-optic cable past all Burlington homes, and begin offering services outside the city. Leopold said those early figures proved inaccurate. With about 85 percent of Burlington’s homes able to connect to BT, and only 4600 subscribers, costs are approaching $50 million — $17 million of which taxpayers loaned to BT. Leopold expects it will take another $10 million to meet the telecom company’s initial goals. Tim Nulty, BT’s first general manager, said his 2007 estimates were based on industry norms. He can’t understand how the city could have spent almost twice the amount originally budgeted. It’s also curious to note that both Leopold and Kiss opposed expanding BT services beyond Burlington when they first arrived in City Hall in 2006, something Nulty advocated. “The time wasn’t right,” said Leopold. Now, without an expansion, BT could go under — the same fate FairPoint fears. The worst-case scenario is BT would be forced to sell its fiber-optic system — valued at $75 million — to recoup losses. One of BT’s competitors, Comcast, is concerned about BT’s reliance on taxpayer money and whether it gives BT a competitive advantage. “Competition is good in the marketplace as long as everyone operates on a level playing field,” said Laura Brubaker, a Comcast spokeswoman. “Would I like to compete on a level playing field with Comcast? You bet,” he joked, noting that Comcast is not a cash-strapped startup but a multibillion-dollar company. Gee, whose pockets do you think are deeper? As a Burlington taxpayer, I’d rather not find out. Lead by Example —This week, the Douglas administration will begin identifying the actual jobs they plan to cut in order to trim $7.4 million in labor costs from the FY 2010 budget. The goal is to have a statewide list ready by the end of next week. Douglas claimed the “union chiefs” want more money for state workers while Vermont is looking to cut $7.4 million. Let’s look at the facts: Twice this year the union has presented plans to trim money while minimizing the number of layoffs. The guv’s team has rejected these plans in favor of laying off hundreds of workers. To date, more than 650 positions have been eliminated, with as many as 300 more on the chopping block. As “Fair Game” has noted before, Douglas rejected the union’s recent offer to trim $7.4 million because the union wouldn’t agree to long-term cuts for FY 2011 and 2012. Douglas likes to claim that we have more than 8000 state employees who cost taxpayers $70,000 apiece when you add salary and benefits — that’s a $50,000 average salary plus $20,000 in benefits, by his calculations. First, there are fewer union employees on the state payroll today than in 2003 — at least if you look at the number of workers vulnerable to the impending purge. In 2003, more than 6800 toiled for the executive branch; today, the number is 6714. Compare that to the trend in gubernatorial appointees: 520 in 2003 versus 600 in 2008. Second, the typical state worker makes less than $50,000 a year — it’s actually $45,000. Meanwhile, gubernatorial appointees earn roughly $66,000, and they get the same benefits as union workers. Speaking of “benefits,” when someone asks you how much you make, do you add up every single paid sick day, workman’s compensation claim, retirement check, subsidized health care premium and vacation week taken by every coworker and then compute your share of what was used? Me neither. That’s what Douglas is doing. You’d expect more from one of the highest paid governors in the U.S. Douglas gets a free driver and $14,000 in meal allowances on top of his $142,500 annual salary. What was he saying about leading by example? Bernie & Me — U.S. Sen. Patrick Leahy (D) isn’t the only Vermont pol with big-screen credits. Leahy is known for his cameos in Batman movies. Now U.S. Sen. Bernie Sanders (I) — Leahy’s junior — can claim an appearance in Michael Moore’s new documentary, Capitalism: A Love Story. Sanders also appeared in Robert Greenwald’s Outfoxed, a documentary about FOXNews and its ties to the conservative spin machine. In Outfoxed, Sanders talks about the need for progressives to fight back against the “right-wing noise machine,” as he dubs it. In Capitalism, Sanders uses his one-minute cameo to explain that U.S. culture too often values greed: worshipping millionaires rather than police officers, firefighters and teachers. Sanders’ appearance follows Moore’s claim that calling Barack Obama a “socialist” made younger voters become more curious about the term. Sanders told “Fair Game” Moore interviewed him for about 15 to 20 minutes in his D.C. office. That got edited down to a minute in the film. To get the full, uncut version, head to Merrill’s Roxy in Burlington on Friday. Sanders will give a brief talk and host a Q&A after the 6:50 p.m. showing. He’ll also introduce the late show, at 9:30 p.m. The Dean Machine — Former Gov. Howard Dean recently hosted a reunion at his Burlington home, drawing about 100 folks who worked for him during his 11 years as Vermont’s chief executive. “It was fun — lots of people I haven’t seen in a long time, lots of reminiscing, lots of light-hearted political junkies’ discussions,” said Attorney General Bill Sorrell, who was Dean’s administration secretary. Fun aside, Dean did make one serious announcement at the event, according to Kate O’Connor, his longtime political aide. “Despite the speculation, he had not gathered everyone together to announce that he was running for governor,” joked O’Connor. Maybe Dean isn’t running, but O’Connor is advising Senate President Pro Tem Peter Shumlin (D-Windham) as he mulls a bid for governor. “What happens if he does has yet to be determined,” she said. County Cluster@#$%! — As many as four of Chittenden County’s six Senate seats may be up for grabs in 2010, and more and more Democrats are lining up in hopes of claiming one … or two or three of them. Months ago, blogger and UVM prof Philip Baruth announced he’d make his first bid for the Senate. He’s now got competition from county Democratic chairman Mike Yantachka of Charlotte and former Burlington city councilor Andy Montroll. Labor activist Ralph Montefusco is “more in than out.” State Rep. David Zuckerman (P-Burlington) is weighing a run for state Senate or lieutenant governor as a Democrat. Party Principles — Horse logger and peace activist Boots Wardinski, a longtime Liberty Union member, is entering the race for lieutenant governor as a Progressive. Wardinski announced on the blog Broadsides that he’s running to earn the Progressive Party label because some Progs are considering bids for office in the Democratic primary. Specifically, Wardinski points to Rep. Zuckerman’s potential bid for office. Wardinski supports single-payer health care, closing Vermont Yankee, cutting off funds to Vermont’s national guard for military service, and legalizing marijuana. Zuckerman said he’s already a vocal leader on most of these issues, and Martha Abbott, the Prog’s party chair, said she isn’t concerned about a possible primary. “Our challenge is to maintain our identity as a party that represents the interests of working Vermonters of middle and low income … but also to cooperate with the Democratic Party when the stakes are significant,” said Abbott. What’s in a Name? — Vermont Republicans would love nothing more than to reverse the clock to the days when there was ostensibly one party: the Grand Old Party. The Friends of Chittenden County Republican Legislators are hosting a Burlington fundraiser next week. The star of the night will be Gov. Jim Douglas, touting the success of his so-called Clean and Clear Program. Other GOP stars have been invited, too, including Lt. Gov. Brian Dubie, State Sen. Randy Brock and Auditor Tom Salmon, the newest fish in the GOP school. The funniest part of this event is where it’s being held: ECHO. The hands-on lake education center is housed in the Leahy Center for Lake Champlain — as in Democratic U.S. Sen. Patrick Leahy, who is up for reelection next year. Not sure this will help the GOP hook a candidate to run against the senior senator. Don’t Bogart that Decision —Will this be the week that Lt. Gov. Dubie announces his political flight plans for 2010? 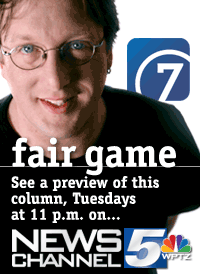 Former campaign manager Susie Hudson tells “Fair Game” we’ll know more later this week. We’ve heard that before. The longer he waits, the less likely Dubie is to run, in our humble opinion. This week marks a full month since Gov. Douglas announced he would not seek reelection to a fifth term.